Newland’s sixth-generation UIMG technology gives the scan engine an edge with unrivaled decoding capabilities on 1D & 2D barcodes. Optimized for reading 1D barcodes, the NLS-EM3090 can decode high-volume 1D barcodes and those of poor quality effortlessly. The NLS-EM3090 supports USB and TTL-232 interfaces to meet diverse customer needs. 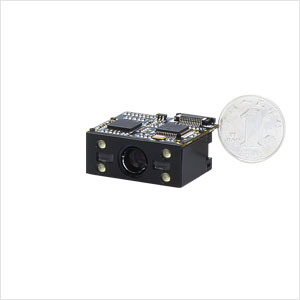 Seamless integration of imager and decoder board makes the scan engine extremely small and lightweight and easy to fit into space-constrained equipment. The advanced UIMG technology incorporated in the scan engine helps reduce the power consumption and prolong the service life of the device. Software development board for the NLS-EM3090, equipped with a trigger button, beeper and RS-232 & USB interfaces. USB Used to connect the NLS-EVK3000 to a host device. **Test conditions: Code 39; 3 Bytes; Resolution=10mil; W:N=3:1; PCS=0.8; Barcode Height=11mm; Scan Distance=120mm; T=23℃; Illumination=300lux.